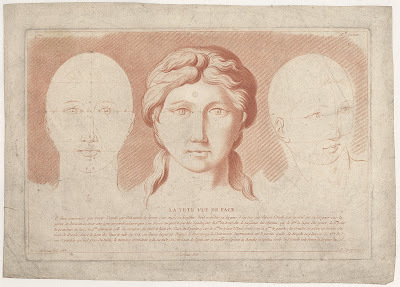 “La Tete Vue de Face” (as titled on plate), 1788, after a drawing by Philippe-Louis Parizeau (1740-1801), published by Jacques Chéreau (1688–1776)—as Chéreau had passed away in 1776 and the design for this print was executed in 1788 (as inscribed on the plate) I presume that Chéreau’s name as the publisher is with regard to his publishing house under the direction of Charpentier. 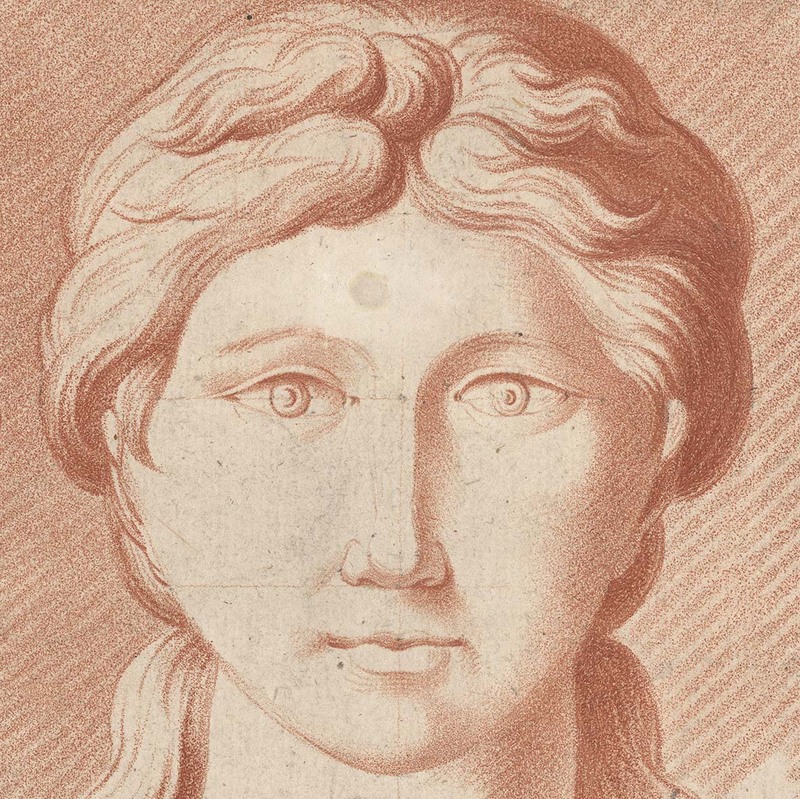 Crayon Manner stipple etching printed in sanguine on laid paper with margins (as published?) backed with a support sheet. Numbered on plate within the image borderline: (upper left corner) “me / 2” [? ]; (upper right corner) “IIIe. Cahier / B”; indexed on plate with numbers on left face from “1” to “5”. 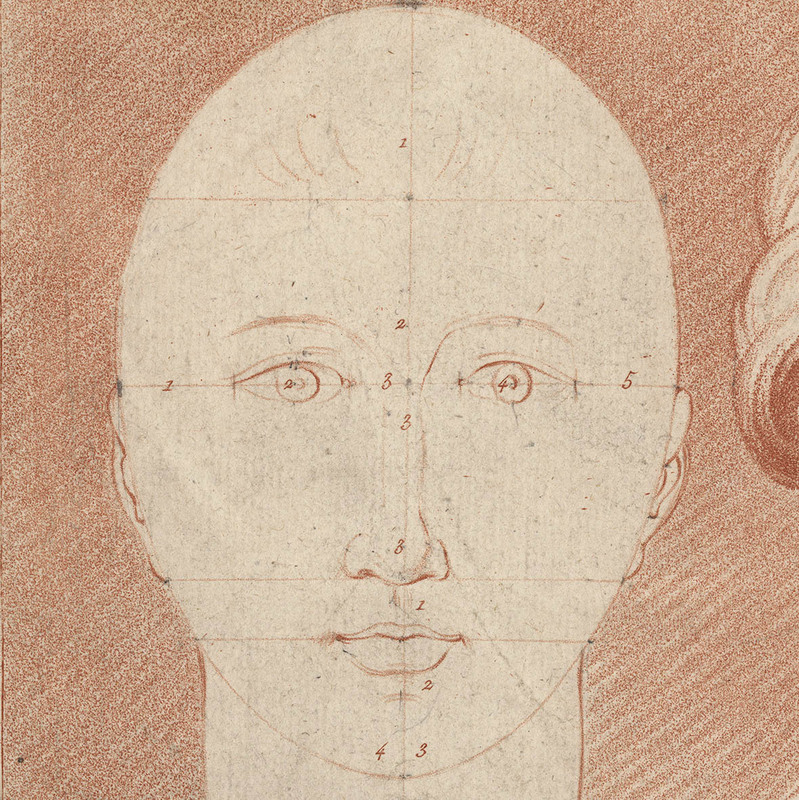 Condition: good impression but with surface dustiness, handling marks, flattened folds and a replenished hole in the forehead of the centre face. The sheet has been laid onto a support sheet of archival (millennium quality) washi paper. I am selling this late 18th century stipple etching used by art students as an instructional study for understanding the proportions of the facial features, for AU$92 in total (currently US$65.50/EUR56.93/GBP49.99 the time of posting this listing) including postage and handling to anywhere in the world (but not, of course, any import duties/taxes imposed by some countries). If you are interested in purchasing this curious etching designed to replicate the coarse texture of a crayon drawing through lines of very fine dots, please contact me (oz_jim@printsandprinciples.com) and I will send you a PayPal invoice to make the payment easy. While I was examining the proportions proposed by this instructional study and shaking my head that the width of the mouth seems too short—usually the width of a mouth is the equivalent size to the gap between the centrepoint of the subject’s eyes—the thought occurred to me that the artist may not wrong. I might be wrong … heaven forbid! 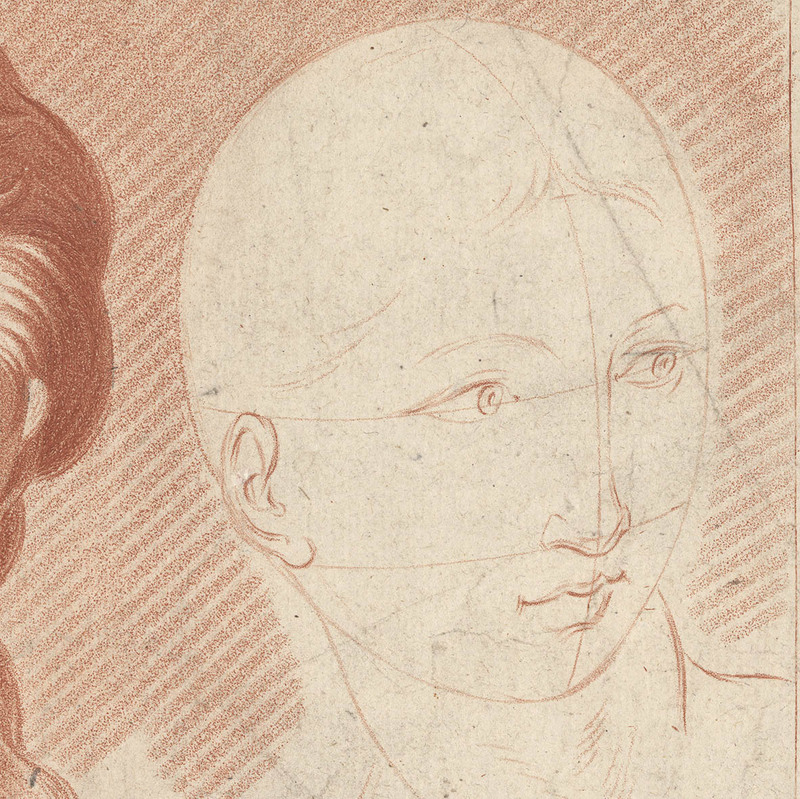 Indeed, the ideal mouth for ladies in the 18th century might have been small. Perhaps too small to munch properly on a scone! Even the width of the faces seems very odd to me—usually the space between the eye and the ear should be around a half of the width of an eye. 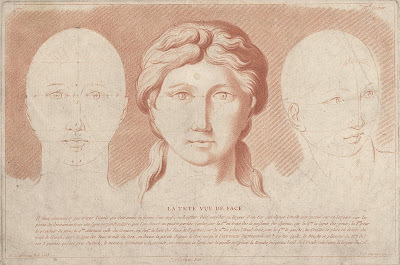 Again, however, the ideal 18th century woman must have had a very round face.